Responsibility. It is one of the most important values we can pass on to our children. As children grow into young adults, it becomes increasingly clear that responsibility is at once a simple concept and a quite complex one. If you didn’t stop a friend from driving drunk and the friend causes a crash, are you responsible? If your boss tells you to deliver the pizza within ten minutes and you speed to get there, are you responsible, is your boss, or are you both? In today’s post, our San Francisco injury law firm looks at one small segment of this issue from one particular vantage point: truck accidents and legal responsibility. Authorities are trying to determine what caused a multi-vehicle accident in San Francisco this past Saturday afternoon. Per the San Francisco Chronicle, the unidentified driver of a semi-truck suffered life threatening injuries after colliding with one vehicle and crashing into three parked cars before hitting a building located at 21st and Guerero. A second person was also injured in the incident. The Chronicle reports that photographs on social media sites show the truck bore a Safeway logo. Winning an accident claim or obtaining a favorable settlement requires the injured party identify the responsible party, show fault, and demonstrate how the accident impacted the victim (i.e. prove damages). 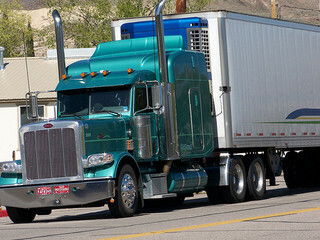 When a commercial truck causes an accident, there are a number of parties who may be deemed responsible including but not limited to: The driver; The company that owns the truck; The company that employs the driver; The company (and/or individual people) that loaded the vehicle; The manufacturer of the truck or any components; and Any company involved in maintaining the truck. Legal liability may be shared among several of these players and they may join forces (and legal teams) to fight the plaintiff or may point fingers amongst themselves leaving the plaintiff and the judge/jury to figure out who is responsible. In some cases, liability and responsibility for the damages are divided up according to percentage of fault. One of the most important legal concepts in these cases is respondeat superior. As California Civil Jury Instruction 3701 explains, a company can be held liable for the actions of an employee acting within the scope of employment (i.e. doing his/her job). In order to try and avoid liability, companies have been known to try and distance themselves by renting vehicles and hiring drivers as independent contractors instead of employees. Federal laws and regulations have evolved to help avoid this and companies are generally held responsible for trucks bearing their name or their placard (a permit card typically affixed to the door) even if the driver is an independent contractor. As with all vehicle accidents, preserving evidence is crucial to obtaining compensation after a truck accident. There is a special law that requires a certified truck inspector review the scene of an accident to help determine the cause, particularly if mechanical issues came into play. Notably, it is usually the government agency that would have this report, not the police. Knowing where evidence may be housed is important to proving who is at fault. Whenever possible, our injury team would also want to have own experts visit the scene before it is cleared and view the scene ourselves. We know it is tempting to think you can “go it alone” after an accident and the responsible parties will often try their best to get you to settle without consulting a lawyer (a warning in itself!). We urge you to reconsider. The law is complicated. All too often people sign away their rights in an attempt to put an accident behind them. You may have legal rights you don’t know about, including rights to compensation for the future. It is also important to consider all individuals and entities that may share in legal responsibility, in part because it can be difficult to collect large amounts from an individual. If you are injured in an accident involving a truck or other commercial vehicle in Northern California, Attorney Brod can help. An experienced San Francisco truck accident attorney, Attorney Brod offers a free initial consultation and most cases are handled on a contingency fee basis meaning you only pay if you recover compensation.